There had to be a sacrifice, but thankfully it wasn’t Funko Pop Watchmen. The Pop! Movies set features main characters from the theatrical version of Watchmen. Director of the 2009 film, Zack Snyder, a.k.a. "Mr. DC" (not actually his nickname, but it should be), maintained key elements and anti-heroes from the graphic novel series. And, the same can be said for the Funko Pop Watchmen editions, too. 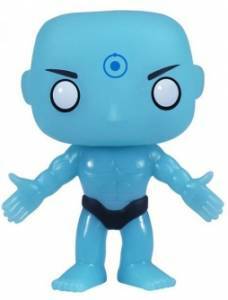 Wearing only a black speedo, the Dr. Manhattan figure has a light blue, almost shimmering body. 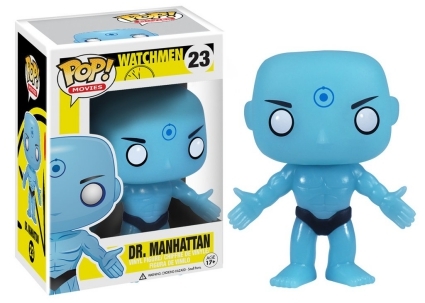 Also matching the big-screen version, Dr. Manhattan’s forehead displays a circle around a large dot, which is actually a nucleus with an electron orbiting around it. Shop for Funko Watchmen Figures on Amazon. 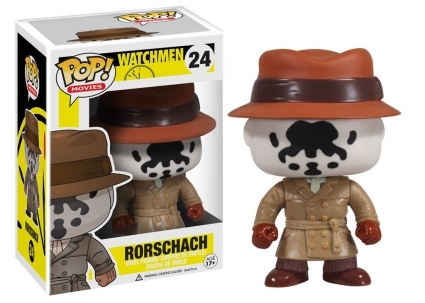 Providing a few more choices, Funko Pop Watchmen offers two versions of Rorschach for fans to collect. Although both figures of the volatile detective stand in a tan overcoat with a brown fedora and (latex?) 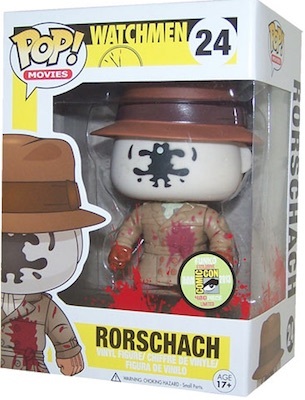 gloves, Rorschach with a blood stain on his coat is a 2013 San Diego Comic-Con exclusive. 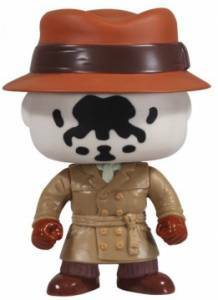 Collectors should note that Funko went above and beyond for the SDCC figure, which is limited to just 480 pieces, as the Rorschach variant actually has a different pattern on the black-and-white mask. Vaulted Funko POP Set of Dr. Manhattan and Loose Barney Rubble!! Rare! !